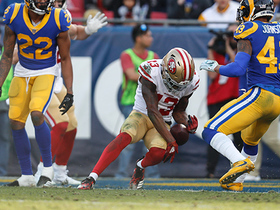 Analysis: With the 49ers playing from behind for the majority of the second half, Mullens was forced to throw on almost every down. As a result, the outstanding Chicago defense was able to hold him to his least productive outing of the season. With just seven touchdown passes over his last six games, he's been a so-so fantasy option with limited upside. 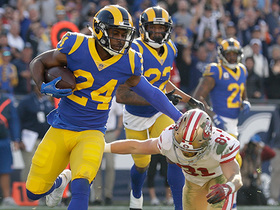 Analysis: San Francisco was down 27-3 just 16 seconds into the third quarter, so most of this was a garbage-time effort from Mullens. 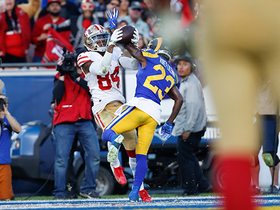 Nevertheless, the rookie would set career highs for attempts, completions and yards in the contest while finding Dante Pettis for two touchdowns. 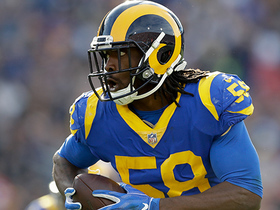 Things get briefly better for the 23-year-old with a home matchup against Denver in Week 14, but he'll be tough to trust in the fantasy playoffs with a rematch against Seattle followed by Chicago in Weeks 15 and 16, respectively. Coach Kyle Shanahan said Monday that Mullens will remain the 49ers' starting quarterback for their Week 13 game against the Seahawks, Curtis Pashelka of The San Jose Mercury News reports. "We're playing this year out with [Mullens] and [C.J. 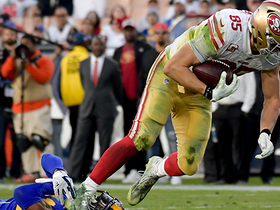 Beathard] and we'll see how games go," Shanahan said. "We're going to do everything we can to win a game. I know we're preparing with Nick and if he ever struggled I'd bring in C.J. We'll see how it goes." Coach Kyle Shanahan wasn't impressed by Mullens' performance in Sunday's 27-9 loss to Tampa Bay, Eric Branch of the San Francisco Chronicle reports. "I don't think he played very well, just looking at some of our situations, but that wasn't all on him," Shanahan said. "No one played very well, especially in the passing game." 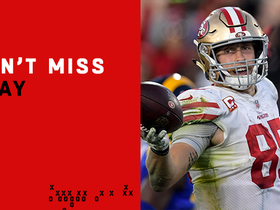 Mullens completed 18 of 32 passes for 221 yards with a touchdown and two interceptions in the 49ers' 27-9 loss to the Buccaneers on Sunday. He also lost a yard in two carries and fumbled once but recovered. Coach Kyle Shanahan confirmed Mullens will remain the 49ers' starting quarterback following a Week 11 bye, David Lombardi of The Athletic reports. Mullens completed 27 of 39 passes for 250 yards, a touchdown and two interceptions in Monday night's 27-23 loss to the Giants. Mullens confirmed that coach Kyle Shanahan has appointed him as the starter for Monday's game against the Giants, Matt Barrows of The Athletic reports. 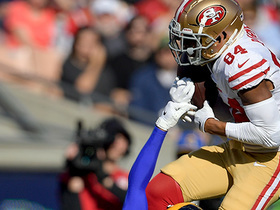 Mullens is expected to remain the 49ers' starting quarterback Week 10 against the Giants, Jay Glazer reported on "Fox NFL Sunday." Coach Kyle Shanahan declined to name Mullens or C.J. Beathard the team's starting quarterback for the Week 10 matchup against the Giants when he met with the media Friday, Matt Barrows of The Athletic reports. 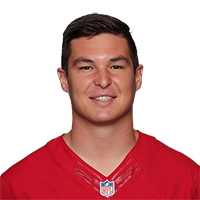 Mullens completed 16 of 22 passes for 262 yards with three touchdowns and no interceptions in the 49ers' 34-3 win over the Raiders on Thursday. He also lost three yards on four rushes and fumbled once, but it was recovered. The 49ers confirmed Mullens will be their starting quarterback Thursday versus the Raiders. Analysis: Mullens is filling in for C.J. Beathard, who continues to have difficulty gripping a football. While he's preparing for his first regular-season snap, Mullens fared OK during the 2018 preseason, completing 31 of 43 passes for 396 yards, one touchdown and three interceptions. Mullens is expected to start Thursday's game against the Raiders, Adam Schefter of ESPN reports. 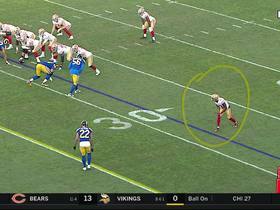 Analysis: The 49ers' typical starting quarterback C.J. Beathard is still having difficulty gripping a football, paving the way for Mullens to see his first NFL action. Beathard will serve as Mullens' backup, though, after third-stringer Tom Savage was released Thursday afternoon. During the 2018 preseason, Mullens completed 31 of 43 passes for 396 yards, one touchdown and three interceptions. Coach Kyle Shanahan said Mullens will start Thursday versus the Raiders if C.J. Beathard (wrist) is unable to play, Matt Barrows of The Athletic reports. Analysis: After Beathard was listed as a non-participant on Monday's estimated injury report, he had trouble holding a football Tuesday as a result of a sore right wrist. With no practice yet this week, his status could come down to a game-time decision Thursday. In the event Beathard is inactive, Mullens and his zero NFL snaps would be given the nod over veteran third-stringer Tom Savage. Coach Kyle Shanahan suggested Mullens would retain the backup quarterback role for Sunday's game against the Rams, despite the 49ers' recent signing of Tom Savage, Chris Biderman of The Sacramento Bee reports. "[Savage] just got here and by no means are we trying to have a number two quarterback competition battle right now," Shanahan said. "We're trying to get our starters ready to play, continue to prepare our backups in case something does happen and if that does ever happen, we'll deal with it then." 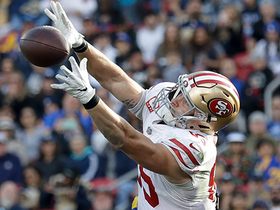 Mullens will be signed from the 49ers' practice squad to serve as C.J. Beathard's backup following Jimmy Garoppolo's season-ending knee injury, Matt Maiocco of NBC Sports Bay Area reports. Analysis: The 49ers are also planning on bringing in a group of veteran free-agent quarterbacks to compete for the backup job Tuesday, so Mullens' stay on the 53-man roster may be short-lived. The 23-year-old completed 72.1 percent of his passes for 396 yards, one touchdown and three interceptions this preseason. Mullens completed 11 of 13 passes for 141 yards and a touchdown in Thursday's 24-21 preseason win over Dallas. Analysis: Mullens was the third San Francisco quarterback to enter the contest, leading a fourth-quarter charge to secure the exhibition victory. The 23-year-old was near-perfect, but his lone mistake was a glaring one -- he threw a pass directly to a Cowboys linebacker for an interception. Mullens is a clear No. 3 on the depth chart, which will make it tough for him to make the 53-man roster barring an injury to Jimmy Garoppolo or C.J. Beathard. 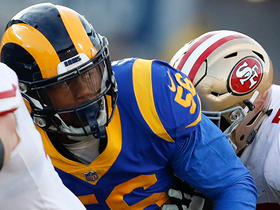 San Francisco 49ers quarterback Nick Mullens delivers a strong pass to wide receiver Richie James for a 22-yard gain.